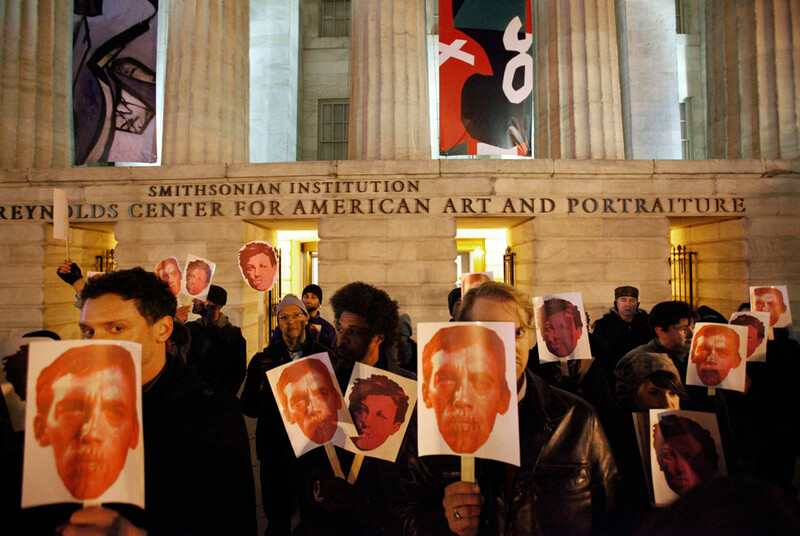 In this Dec. 2, 2010, file photo, protesters hold masks in support of artist David Wojnarowicz on the steps of the Smithsonian's National Portrait Gallery, after a video by Wojnarowicz was removed from exhibition at the museum, in Washington. AP Photo/Jacquelyn Martin. PITTSBURGH, PA.- The Mattress Factory Museum is currently screening David Wojnarowicz's "A Fire in My Belly." The video is now on view in the Mattress Factory lobby through February 13, 2011. On November 30, 2010, the artwork was removed from the National Portrait Gallery's "Hide/Seek: Difference and Desire in American Portraiture" exhibition in response to pressure from well-known political and religious figures who threatened to end funding to this gallery administered by the Smithsonian Institution. Currently, in Pittsburgh, the Mattress Factory Museum, the Andy Warhol Museum, and the Wood Street Galleries have all chosen to screen "A Fire in My Belly." These Pittsburgh arts organizations are joining others nationwide, including The Institute of Contemporary Art, Boston, MA; The Hammer Museum, Los Angeles; the Pacific Institute for Contemporary Art, Portland, OR; The New Museum, New York; International Center for Photography, New York; The Glassel School of Art, Houston, TX; Stanford University, Palo Alto, CA; The Tate Modern, London; and many more. "The Mattress Factory has spent 34 years providing a voice for artists who let us see the world through their eyes. That view exposes the good and the bad. Sometimes that view is difficult to watch, but should never be silenced." said Michael Olijnyk, Co-Director. "An institution [the National Portrait Gallery] that stands for American art simply must show American art. Anything less is a violation of our freedom of speech and expression." said Barbara Luderowski, Co-Director. The film, A Fire in My Belly, A Work in Progress (1986-87), is a poetic meditation on man, life, death, faith, and suffering made in part as a response to the AIDS-related death of his close friend, artist Peter Hujar. In the 13-minute silent film, Wojnarowicz juxtaposes informal black and white footage from the streets of Mexico with staged color images in a rough montage. After Wojnarowiczs own untimely death from AIDS in 1992, a separate seven-minute version was found in his studio. A four-minute excerpt was created from the original thirteen-minute version for the exhibition "Hide/Seek: Difference and Desire in American Portraiture" by the co-curators. Photo Museum Antwerp Showing Exhibition by Ville Lenkkeri "The Place of No Roads"